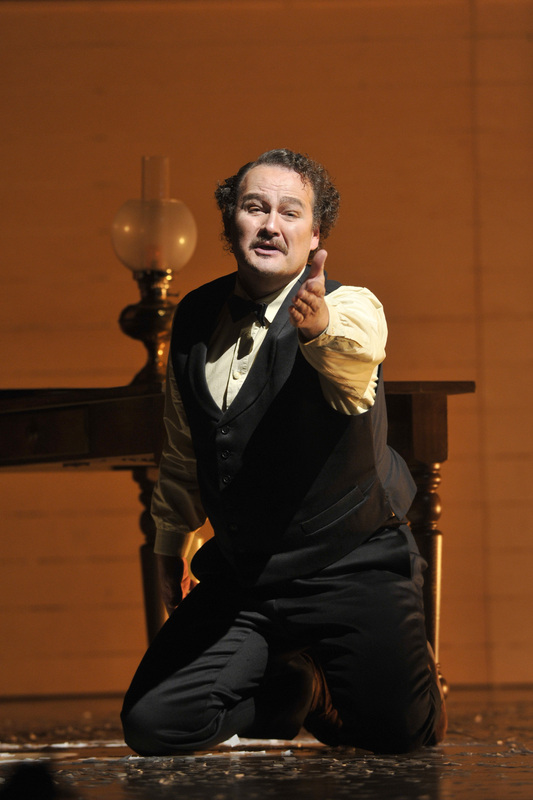 A full report on the Festival Opéra de Québec’s production of Harry Somers’ Louis Riel will appear in our October 2017 print issue. This account comes from the advantageous viewpoint of having already seen the Peter Hinton production in April at its Canadian Opera Company premiere in Toronto. The fundamentals of the staging had not changed much. Hinton efficiently divides the cast of thousands into three groups. A Parliamentary Chorus (the Choeur de l’ Opéra de Québec, who launch their play-by-play commentary from upstage bleachers, singing their complex music with well-oiled precision and dramatic commitment); a Land Assembly and, ‘the rest of them’—the named roles of real-life Métis, English and French historical personages. As in Toronto, volunteer supernumeraries from the Indigenous community formed the Land Assembly, one of Hinton’s efforts to restore a First Nations voice to the opera. This necessary and worthy intervention proved difficult to pull off, as it had in Toronto, given the awkward gaps that often emerge when seasoned professionals play alongside amateur performers unaccustomed to moving onstage. The net result was a dramatic vacuum in many of the slow-moving scenes involving this group. A significant alteration to the Toronto staging occurred at the top of Act 3 during Marguerite Riel’s demanding solo scene—the contentious ‘Kuyas’. Signalled in the program notes as a melody misappropriated by Somers as a lullaby, it should rightfully only be sung as part of Nisgaá mourning ceremonies. In Toronto, this powerful scene was given in its original context with the positioning of an infant’s cradle centre stage. In Québec (as in June’s National Arts Centre performances), the cradle had been removed, leaving soprano Simone Osborne stranded to sing her lengthy, poetic solo without any narrative reference. This, together with her subsequent plea for Louis to remain with his wife and children at their Montana home, must have been disorienting to an audience likely seeing the opera for the first time. Regardless, Ms Osborne delivered this demanding scene movingly, with bright, clear, carrying tone. The sense of disconnect was further magnified in subsequent scenes where Julie, Riel’s mother, speaks to her son tenderly about the children he left behind. Drawing attention to the wrongful appropriation of an Indigenous melody was necessary and handled admirably in the program notes by all three participating theatres. However, opera is essentially a dramatic art form and Somers, along with librettist Mavor Moore, knew exactly what they were doing by introducing Marguerite with a lullaby. Removing the cradle turns the song into an almost abstract, wordless vocalise stranding the singer, the scene and the audience in a dramatic abyss. Despite these narrative gaps, the production offered superlative performances in many of the principal and comprimario roles. 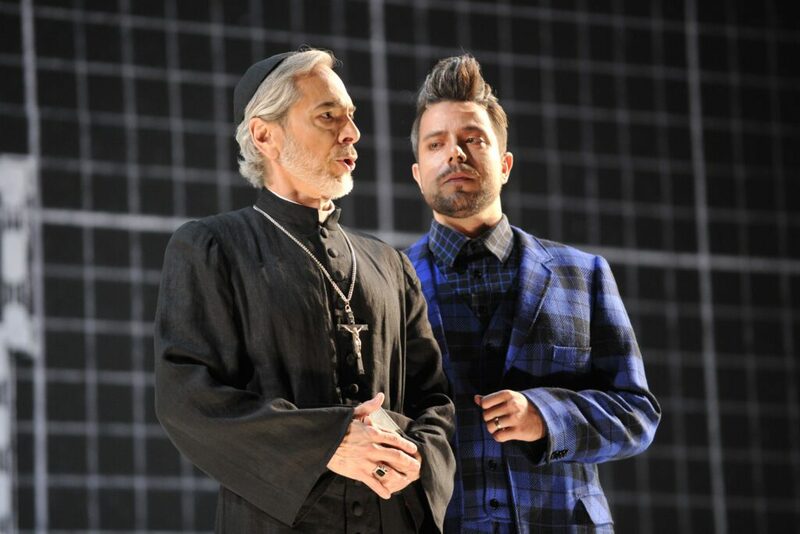 Russell Braun demonstrated once again his consummate virtuosity as an actor and singer, committing himself fully to the extreme psychological and vocal demands of the title role. He mastered Riel’s several ‘visions’—unhinged, cadenza-like, a cappella vocalises that rival Donizetti’s famous bel canto mad scenes in their relentless exploitation of the baritone’s highest range. Allyson McHardy conveyed Julie Riel’s implacable support for her son singing with beautiful warmth of tone challenged only when trying to project the lower passages of her opening solo; one instance of Somers’ often ungrateful vocal writing. Among the many smaller roles special mention should be given to young soprano, Joanna Burt, whose portrayal of Riel’s sister, Sara, had grown in stature since Toronto to convey even more disturbingly her fanatical, religious fervour. 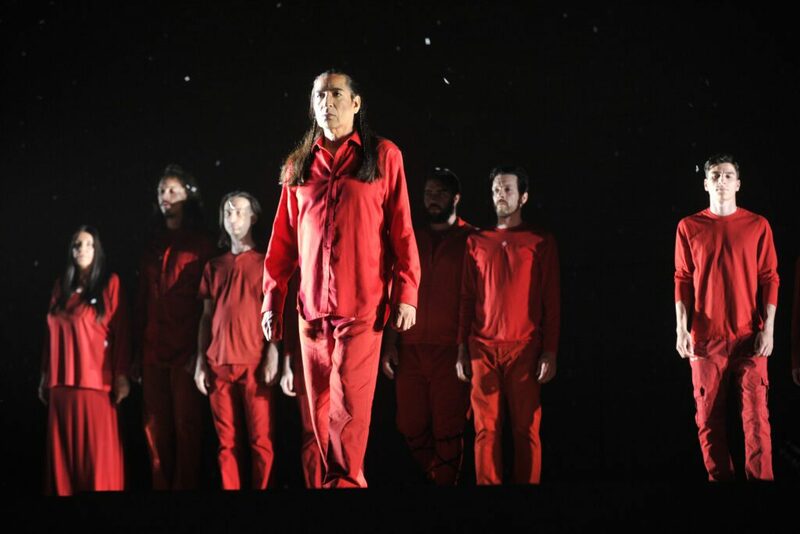 Riel is a very ‘texty’ opera and some singers were better than others at projecting the libretto clearly be it in Michif (the Métis language), French or English. More seasoned performers could have taken a lesson from tenor Aaron Sheppard (Donald Smith and Sir Frederick Middleton) whose every word was clearly projected without losing anything in musicality and audibility. The Orchestre Symphonique de Québec under Jacques Lacombe handled their rhythmically and harmonically challenging parts with the required virtuosity and dramatic intent.